I’ll start with the good news first. This year, Oregon lawmakers passed a number of bills that protect and expand access to healthcare for Oregonians like Cover All Kids, Reproductive Health Equity, and the Healthcare Protections Bill. Across the state and nationally, family advocates and health experts have cheered the progress in Oregon. And with good reason: As threats to healthcare loom at the national level, Oregon leaders need to do everything they can to protect coverage, reduce premiums, and provide certainty for Oregon families. The Oregon Healthcare Protections Bill does just that, ensuring more Oregonians have healthcare than ever before. But a small collection of extremist groups, like the anti-LGBTQ Oregon Family Council, and a handful of conservative legislators are trying to do undo all that progress. 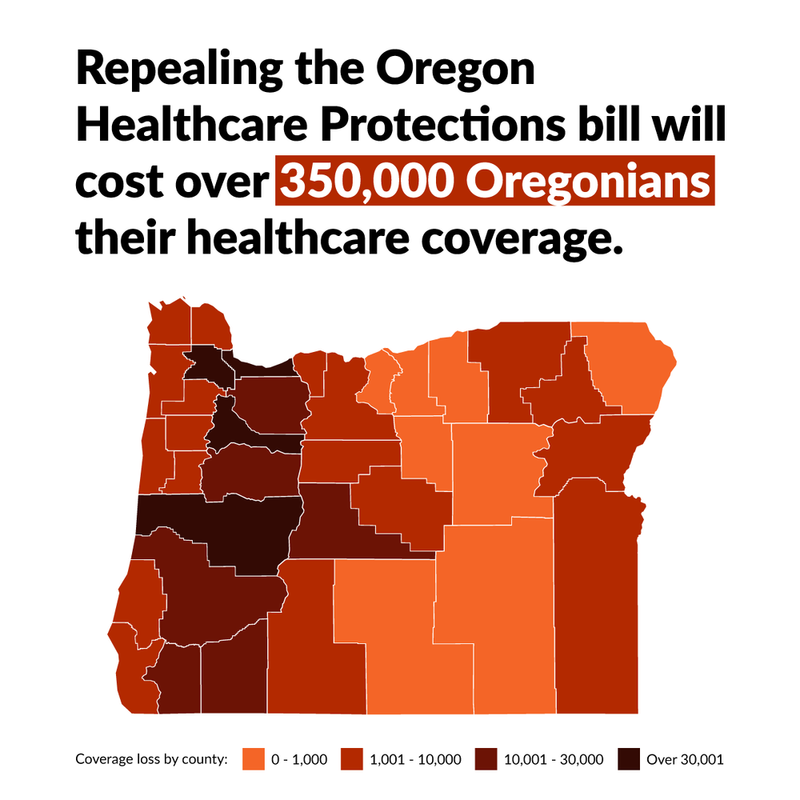 They’ve written a referendum that would rollback key pieces of the Healthcare Protections Bill — taking away healthcare and raising premiums for more than half a million Oregonians. The stakes couldn’t be higher, and this attack on Oregonians’ healthcare is already underway. Signature gatherers are hitting the streets now to qualify Referendum 301 for the ballot, so we have to act fast to protect Oregon families. Contact your legislator today and urge them to stand up and speak out against this dangerous referendum. Then, talk to your friends, your family, and your social network about declining to sign Referendum 301. Every signature this extremist coalition gathers puts Oregonians’ healthcare more at risk, so we have to get the word out now. If we stand together, speak out, and fight back against these attacks, we can protect Oregon families. Oregonians for Immigration Reform, an organization with deep ties to white nationalist groups, is moving forward with Initiative Petition 22, which would repeal our state’s 30-year-old inclusivity law (ORS 181A.820) prohibiting the use of state and local resources to enforce federal immigration law. This state law was passed in 1987, because local law enforcement personnel were racially profiling U.S. citizens and conducting raids where they lived, worked and worshipped. ORS 181A.820 prohibits this kind of discrimination. Rolling back laws like this would be a huge setback for our state - and goes against the values and mission of the Fair Shot for ALL coalition. We’ve spent the last few years fighting against exclusion and discrimination in Oregon and we won’t stand by while those victories are attacked and the rights of our neighbors are eroded. We’ve heard from officials throughout the state that they do not want to spend precious resources to enforce Trump’s questionable policies, and that immigration enforcement remains the sole responsibility of the federal government. Help us Defend Oregon’s values and sign our pledge to keep Oregon a welcoming state. It would undermine community trust. Oregon state and local law enforcement officials are strong proponents of ensuring that immigration enforcement remains the sole responsibility of the federal government, because they know from experience it makes our communities safer. When community members don’t trust state and local law enforcement, they won’t report crimes to the police or appear in court to testify. It would harm Oregon families. Immigrant families have been in Oregon for generations and are part of the fabric of our state. Repealing this law will give law enforcement license to profile citizens and aspiring citizens alike. Immigrants are our neighbors and colleagues, our friends and family, and deserve to be treated with dignity and respect regardless of their country of birth. And like other Americans, immigrants have a right to a fair trial and due process. It would decimate Oregon’s economy. Immigrants play a vital role in our state’s culture and economy, and they’ve made our communities stronger for generations. We know immigrants are also more likely than native-born Oregonians to start small businesses, which are the backbone of our local economy. Many sectors rely on immigrant employees to keep their businesses competitive and growing, including agriculture and technology. Repealing this law would send a message to that Oregon is not a welcoming state, only worsening our labor shortage and crushing our economy. Join our movement to keep Oregon a state where all of us are treated with dignity and respect. Keeping Oregon strong. Sign our pledge. The 2017 legislative session is now adjourned and we’ve been eager to share the final results with you. With your support, we put forth a bold legislative agenda to create economic opportunities for more Oregonians by taking on some of the longstanding inequities that prevent women, people of color, LGBTQ and working families from getting a fair shot at success in this economy. Oregonians from across the state made thousands of phone calls, emails, and letters; testified at dozens of hearings, and met with legislators to make sure our voices were heard. And your hard work made a difference. Cover All Kids: Oregon is now set to become the seventh state following California, Illinois, Massachusetts, New York, Washington, D.C., and Washington state to provide coverage to 100% of children. Learn more. End Profiling: Building on three years of hard work by our coalition, community groups, and law enforcement, this legislation secures resources for tracking and ending police profiling in every corner of the state. Learn more. Reproductive Health Equity: This nationally significant legislation ensures that every Oregonian can decide when and whether to become a parent - regardless of income, type of insurance, citizenship status or gender identity. Learn more. And while lawmakers did not approve paid family and medical leave insurance or tenant protections that would help keep families in their homes amidst a statewide housing crisis, we raised the dialogue on both issues and built support that will carry forward to future sessions. While we have much to celebrate, our work is far from done. This coalition will be back—stronger and with even more resolve to ensure all Oregonians have a fair shot. We hope you’ll join us. This Saturday, over 300,000 working Oregonians will receive a much-needed raise when our state’s minimum wage increases. This means that full-time minimum wage workers in the Portland area will see a $3,210 increase in their annual pay and minimum wage workers in the rest of the state will earn an extra $1,040 over the course of the year. This boost in the minimum wage is the result of the phone calls, letters, and emails to legislators YOU sent to lawmakers last year, convincing them to raise the wage across the state. With nearly a quarter of Oregon’s workforce concentrated in low-wage jobs, our efforts to raise the wage and defend against attacks on policies that help working Oregonians are making a real difference in people’s lives. Women and people of color have a disproportionate share of low wage jobs, and by raising the wage, we are helping working Oregonians support their families and strengthening our state’s economy. It’s important for workers to check to make sure the raise they expect on July 1 shows up in their paychecks. With three regions and annual increases, there may be instances of employers forgetting to raise wages. Concerned workers can head to the Bureau of Labor and Industries website or call 971-673-0844 to find tools for making sure they’re getting paid the right amount. Nobody who works full time should live in poverty. The minimum wage increase on July 1 is a step forward to hundreds of thousands of Oregonians and another reminder that when we stand together, a fair shot at prosperity for all is within our grasp. Charmaine was raising her children in the same Portland neighborhood where she was raised. They went to the schools she went to and the family was part of the community. They lived in their house with a backyard big enough for a trampoline for seven years. Charmaine was a good tenant and there had never been any issues. After she asked for some repairs to the house, though, she faced every Oregon renter’s worst fears: she received a “no cause” eviction notice. State law allows property managers and landlords to evict with no reason and tenants have no recourse. In a flash, Charmaine’s home was gone. She was unable to find a home in her neighborhood or even in her town. Her family had to move across the river to Vancouver and her children are in new schools, far from the community they grew up in. This story is being replayed across Oregon. Our inflated housing market encourages landlords to take advantage of these no-cause evictions, leaving renters with few options. Tell your senator to support House Bill 2004. House Bill 2004 will limit the unfair no-cause evictions that are happening to families like Charmaine’s. It has passed the House of Representatives and is now going through the Senate. Unfortunately, deep-pocketed and powerful special interests have launched an attack against the bill, trying to stop it before it can get to the Governor’s desk to become law. That’s why everyone must contact their senator today to vote YES on HB 2004. Take action now, for Oregon families. Stop unfair evictions. We’ve almost completed 2 months of the Legislative Session! This week marks a milestone as each of the campaigns on the Fair Shot for All 2017 Legislative Agenda have had their first hearings at the Capitol. Oregon is one step closer to ensuring that every child has access to health insurance and is on the pathway to success. The Cover All Kids campaign has passed its first legislative hurdle by moving out of the House and Senate Health Care Committees. The bills now await hearings in the Ways and Means Committee. In 2015 Fair Shot for All helped pass legislation that banned profiling by law enforcement. This year we’re taking the next step to address profiling by asking the legislature to collect better data, require training of all law enforcement officers, establish accountability mechanisms, and address disparities in drug crimes. HB 2355 is expected to pass out of the House Committee on Judiciary next week. Most Oregonians will one day need time away from work to deal with a serious personal or family illness or to care for a new child. Over 100 community members came to Salem Thursday to share this message with their legislators during the first Family and Medical Leave Insurance (FAMLI) Act hearing in the House Committee on Early Childhood and Family Supports. The Reproductive Health Equity bill, HB 3391, had its first hearing last week in the House Committee on Health Care. Fair Shot coalition partners sent a message loud and clear: Every Oregonian--regardless of income, citizenship status, gender identity, or type of insurance--must have access to full reproductive health coverage. Today, far too many Oregonians are experiencing extreme rent increases and no-cause evictions. Hundreds turned out on March 2nd to testify in support of HB 2004 in front of House Committee on Human Services and Housing. Tell Your Legislators: Oregon renters need stable homes! Oregon is in a housing crisis; especially when it comes to renters. Rents are rising much faster than wages, and people are losing their homes through no fault of their own due to the practice of "no-cause evictions." This has fueled a rapid rise in homelessness, housing instability, and the crushing of dreams for many families -- and if you're a renter in Oregon, it can happen to you too. Enough is enough. It's time for the Oregon Legislature to act and protect families who work so hard to keep a roof over their heads. 1. It's time to end no-cause evictions. As it currently stands, no matter how great a renter you are, or how long you've lived in a home, you can lose your home without cause. That's right, your landlord can tell you to leave without giving you a reason. 2. It's time to let Oregon cities decide whether or not rent-stabilization is right for them. Currently, Oregon state law prohibits cities from enacting rent-control unless extenuating circumstances exist -- and if lawmakers can agree on what those extenuating circumstances are. That's right. If Oregon City wants to enact rent-stabilization, they are BARRED from doing so. Some markets are at a critical moment where continued housing instability due to rising rents will undermine their entire economic success as a city -- they need the freedom to enact rent-stabilization if they deem necessary. What a week it’s been for Fair Shot! On Monday Cover All Kids had its first hearing, on Tuesday hearings continued at the Capitol and dozens turned out in Hillsboro to share their stories of profiling with the Attorney General. Next week is looking just as busy and we want you to join us! Enough is enough. It's time for the Oregon Legislature to act and protect families who work so hard to keep a roof over their heads. Join us March 2, 2017 in Salem to lend your voice, speak with our legislators directly and demand an end to no cause evictions and the ban on rent stabilization. Option 1: Lobby Training and Lobby Visits with Legislators, 12pm-5pm. Option 2: Housing Hearing and Testimony, 5pm-8pm. Option 3: All day! Lobby Training, Visits with Legislators, and Housing Hearing and Testimony, 12pm-8pm. Can’t make it to Salem? Your legislators still need to hear from you about these important policies. Oregon renters need stable homes! Add your comments and share your story: tell your legislators how no-cause evictions and rent increases are harming you and your community. We need Reproductive Health Equity now! The Reproductive Health Equity Act ensures that Oregonians, regardless of income, citizenship status, gender identity or type of insurance, have access to the full range of preventive reproductive health services, including family planning, abortion, and postpartum care. Healthier bodies lead to healthier families, and healthier families lead to healthier communities. Our elected leaders need to hear from all of us why this bill matters and why they must act now. The Fair Shot agenda is building momentum. It’s only about to heat up from here. Join the movement to make sure all Oregonians get a fair shot! With the changing national political landscape, and the presidential election - we have seen an alarming rise in hate speech, and racist incidents happening in communities across Oregon. It's never been clearer to me, that many people still do not have a FAIR SHOT. But even though this political climate puts a magnifying glass on the divide, the reality is none of this is new. Deep disparities exist in every aspect of American life. From healthcare and education, to unemployment and housing, to community safety, we know that many of us are still struggling, and have been for generations. This is why Fair Shot for All was founded. Our coalition has made significant strides for Oregon over the past several years. We won't stop until EVERYONE in Oregon has a fair shot. Join us, in the movement to win a Fair Shot for ALL Oregonians, and sign the petition! Join us and the Oregon Health Equity Alliance on the evening of December 1, 2017 from 5:30 to 8:00pm as we unveil our 2017 Legislative Agenda and discuss how we can come together as a movement for all Oregonians.